The Yale School of Music presents the last Lunchtime Chamber Music concert of the 2011–2012 season on Wednesday, May 2. The concert begins at 12:30 pm in Morse Recital Hall, located in Sprague Hall (470 College Street, corner of Wall Street, New Haven). This free event features a variety of chamber ensembles, each composed of musicians undertaking graduate study at the Yale School of Music. Faculty violinist Wendy Sharp is director of the School’s chamber music program. The Yale School of Music is unique in that all performance faculty coach chamber music, and all students are involved in chamber music for their entire tenure at the School. Ensembles come together each semester and receive weekly coachings from distinguished faculty and guest artists. 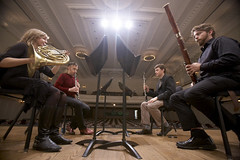 Chamber groups often perform in the Lunchtime Chamber Music concerts, which take place at both Morse Recital Hall and the Center for British Art, and in the Vista series, in which performances are enhanced by spoken commentary on the music. Students also take part in the annual chamber music competition, whose winners are featured in an annual Chamber Music Series concert.